Rotary International is represented by two Rotary Districts in and around Adelaide. This boundary is described on the first page in this series - 'DISTRICT MAPS & CLUBS' and the section through Adelaide Suburbs is shown on the map above. 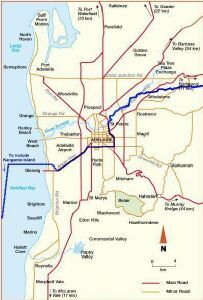 Approximately it is Anzac Highway to the South-West of Adelaide (with a minor deviation at the end to separate Glenelg North - District 9520, and Novar Gardens - District 9500) and the River Torrens to the North East of Adelaide - traversing Adelaide via the South Parklands and East Parklands.